Fans are debating whether the “Jedi” part of the next Star Wars title, The Last Jedi, is plural or singular, with various language translations called into play. Now IGN Germany reports that the new German title for the film – Die Letzten Jedi – seemingly proves that it is plural, otherwise it would have been “Der Letzte Jedi”. It has also been reported that the Spanish translation points to it being plural, while previously the Brazilian translation suggested singular usage. However, an earlier official tweet with the Brazilian title has since been deleted. 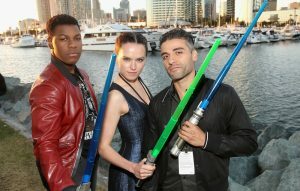 Fans have been debating the semantics to work out if the new film will focus on multiple Jedi or a single Jedi. Fleabag‘s Phoebe Waller-Bridge has reportedly been cast in the forthcoming Star Wars spin-off film focusing on a young Han Solo. The actress responded to these rumours earlier this week at the V05 NME Awards 2017. The post Is ‘Jedi’ in ‘Star Wars: The Last Jedi’ title plural? appeared first on NME.